At the heart of the DMC is our computer lab featuring 18 high-end dual-boot workstations with a full complement of commercial and professional-grade software for completing tasks related to audio, video, photography, graphics, animation, 3D modeling and design, web-based and multimedia projects.. 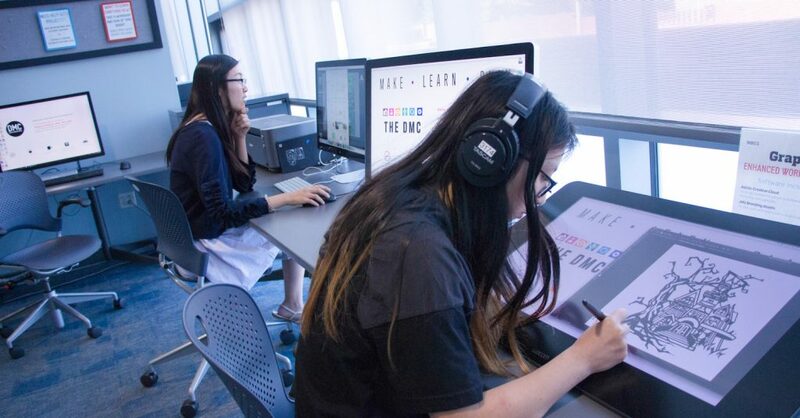 In addition to offering the full Adobe Creative Cloud suite on all of our computers, we also offer specialized stations for scanning, inkjet printing, audio and video editing, 3D design and gaming. Check out the DMC Help Wiki to see a highlights list of available lab software.